Dr. Joseph is a graduate of Washington University St. Louis and the Dr. William M. Scholl College of Podiatric Medicine. His PhD research career began in connective tissue and matrix biochemistry where he received his PhD from Rush University. Since then, his research has focused on translational research and building interdisciplinary research teams that have included carbon engineers, biologists, physical therapists, health communication researchers and various medical and surgical specialties. He continues to be active in basic science as well as clinical trials research through the Center for Lower Extremity Research (CLEAR) and by serving on the Editorial Board for the Journal of Foot and Ankle Surgery. 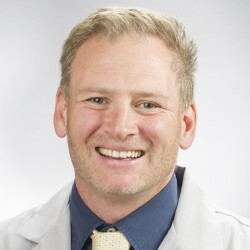 He is an active leader and affiliate with various organizations including the American College of Foot and Ankle Surgeons, the Tissue Regeneration and Engineering Center of Dayton, and the Western Pennsylvania Hospital Foot and Ankle Society. Dr. Joseph welcomes new patients. He has special interest in treating patients that need wound care.